After Superbike had a sit-down with Aprilia’s UK PR manager at The Bike Shed last month, we obviously had to ask whether the Italian factory would be updating its RSV4 Factory for 2019. 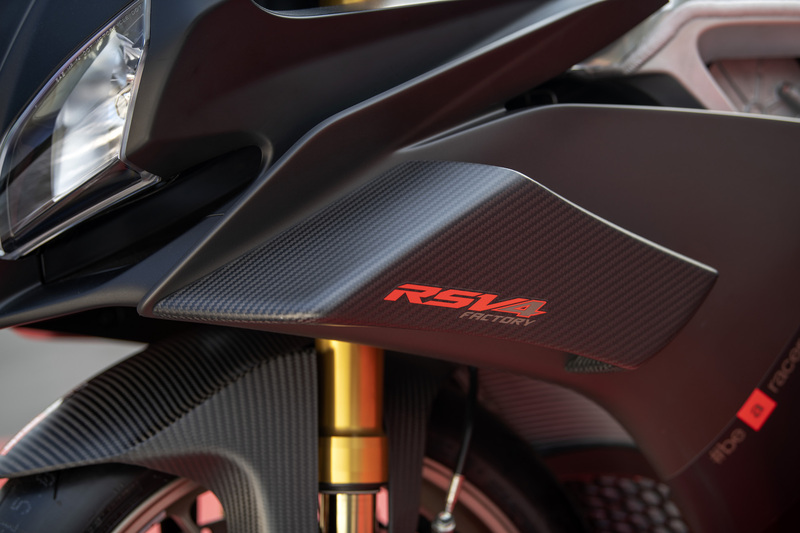 “No” was the poker-faced answer, but the RSV4 RR would be being updated slightly in the form of a new colour scheme or two. “Oh, ok” we thought… “better than nothing”. However, a few hours ago a handful of pics and a press release hit Superbike’s inbox. 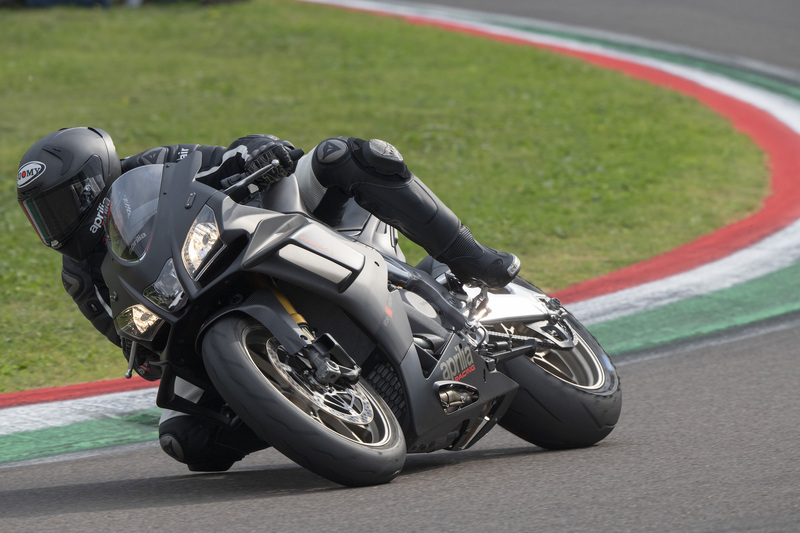 The poker-face was clearly a fib, because for 2019 the RSV4 Factory will have an extra 16 HP thanks to 100 extra cubic centimetres. It’s also getting winglets, a smattering of carbon, brake cooling ducts, a new colour scheme and a bling Akrapovic exhaust. Oh, it’s also gone on a diet (not that it really needed to). It’s not actually an 1100cc now though, technically it’s 1078cc and that was made possible with new pistons and bore increase from 78 to 81mm (the stroke remains unchanged). This capacity hike forced a new oil pump to power twin-jet oil cooling to the underside of the pistons. Intake valve lift has been revised, and 5th and 6th gear now have larger ratios. The red line is now slightly lower at 13,600 RPM and peak power (217HP) is reached at 13,200 RPM. 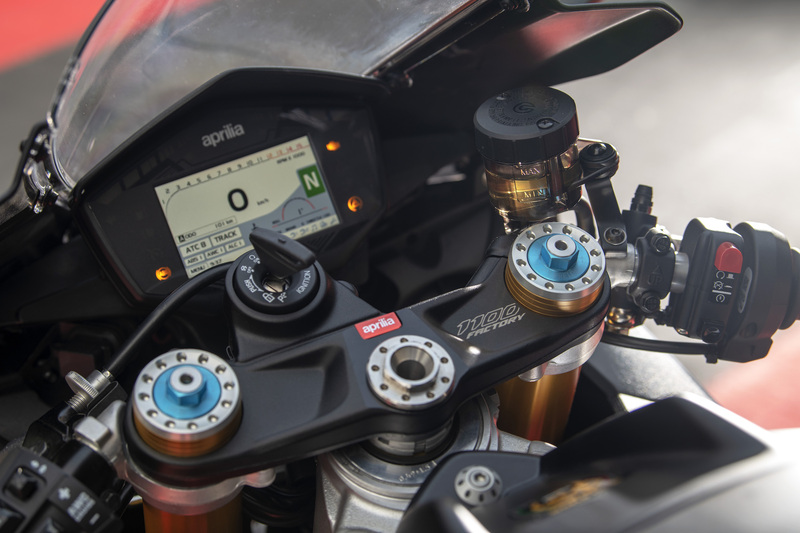 Aprilia say that the increase in capacity has increased torque by a minimum of 10% across the entire rev range, and peak torque is now 122NM at 11,000 RPM. Presumably this’ll make for a better ride on the road, and be even more of a missile on the track. Just for comparison, Ducati’s 1100cc Panigale V4 makes a claimed 214 HP at 13,000 RPM and 124 NM of torque at 10,000 RPM. But this wasn’t just about a few bits of carbon and an engine upgrade. 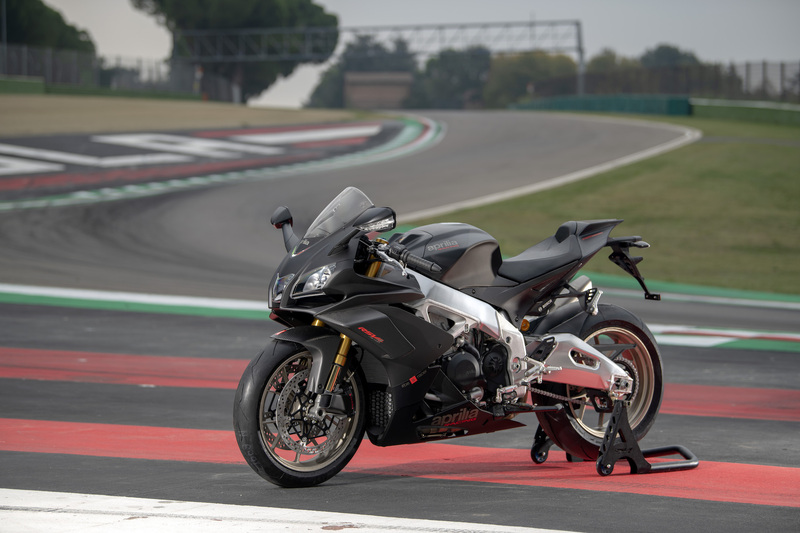 The Ohlins NIX forks gain an extra 5mm of travel and the wheelbase has been shortened by 4mm, and behind those brake cooling ducts are now Brembo Stylema calipers (previously found only on the Panigale V4). Electronics remain relatively unchanged except for some uber-fancy corner-by-corner mapping setup ability, a smartphone-bluetooth infotainment system and and a brightness boost to the TFT dashboard. Last but not least, the old lead-acid battery has been chucked out in favour of a lithium-iron battery, meaning fully fuelled and ready to go, the RSV4 Factory now weighs just 199kg.